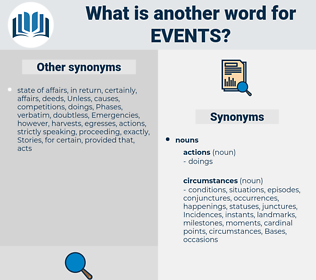 What is another word for events? Festivals, milestones, games, developments, listings, incidents, occurrences, manifestations. accident, development, developments, celebrations, phenomenon, Phenomena, implementation, observances, incident, incidents, ceremony, Ceremonies, occurrence, occurrences, manifestations. Eventualities, tournaments, accidents, Movements, catastrophes, Achievements, experiments, gatherings, engagements, competitions, exhibitions, Appointments, contests, happenings, Festivals, milestones, disasters, Interviews, Festivities, concerts, processions, performances, athletics, complications, revelations, explosions, observance, indications, benefits, Internships, seminars, fluctuations, responsibilities, examinations, Races, presentations, Tragedies, Congresses, campaigns, Occupations, series, assumptions, bouts, decisions, Outbreaks, receptions, discussions, challenges, chances, Lectures, Rallies, exhibits, encounters, games, attacks, episodes, bombings, Assemblies, offences, sequences, Killings, deaths, features, scandals, scenes, pursuits, debates, matches, crisis, Crises, Workshops, troubles, displays, deeds, storms, speeches, trials, doings, Riots, development, developments, Hearings, outputs, rounds, fairs, crashes, Floods, shows, ballots, releases, celebrations, meets, Phenomena, observances, protests, incidents, Ceremonies, occurrences, manifestations, interventions. involvement, international, matters, management, engagement, instruments, actividades, information, evidence, department, institute, vancouver, commonwealth, organization, enterprise, organizational, severe, condition, endeavours, promotion, Hosting, responsibility, monitoring, exploitation, services, conducted, celebrate, functioning, ministers, interests, printer, recreation, programming, highlights, prints, national, planning, findings, experience, experiences, outreach, theme, alberta, effort, Efforts, objectives, agenda, health, The, solidarity, Them, affairs, sport, thematic, conduct, research, personnel, agency, delivery, CEDAW, scope, support, Injuries, des, actos, factual, AE, monday, Crimes, problem, role, Les, works, ahead, c., life, launch, minor, weather, sunday, assays, made, funding, R, Children, Forms, youth. 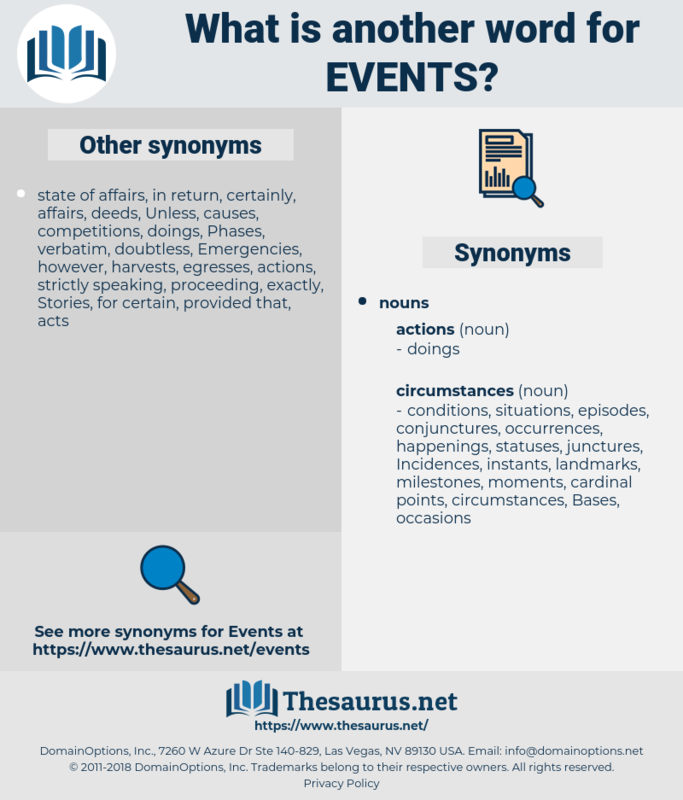 eventos, Advertisements, moments, installments, Environments, requirements, announcements, components, statements, enactments, documents, assignments, conditions, investigations, arrangements, instances, amendments, parliament, evenings, Patients, characteristics, Contingencies, activites, considerations, occasions, times, expositions, commitments, vicissitudes, ventures, invitations, factors, comments, situations, violations, transactions, points, centers, consequences, advantages, disturbances, placements, implications, individuals, perturbations, innovations, Emergencies, type-approvals, purposes, agents, constraints, declarations, utterances, outcomes, champions, sections, organisations, allegations, Adolescents, contexts, enterprises, Organizations, spectacles, contributions, Undertakings, rencontres, observations, stakeholders, institutions, Conferences, disappearances, demonstrators, alterations, happens, effects, steps, settings, Categories, articles, sites, terms, moves, complaints, endeavors, timelines, athletes, advances, principles, sessions, cases, Traineeships, patterns, scenarios, Symposia, symposiums, years, organizers, reactions, course, courses, minutes, disruptions, competences, briefings, representations, conflicts, novedades, organisers, reports, means, upheavals, issues, uprisings, Consultations, elements, Hurricanes, occurences, parameters, goings, appropriate, Incidences, ontario, partners, substances, trends, proportions, 'affaires, things, positions, Plants, Measures, conversions, technologies, relations, timeframes, sit-ins, interactions, terrorists, Medals, minister, dangers, manifest, teens, disciplines, questions, respects, battles, Opportunities, mistakes, perpetrators, referendums, Stations, jobs, jurisdictions, marches, christianity, aspects, souvenirs, timetables, mandates, motives, side-effects, competencies, groupings, details, types, elections, citizens, occurs, routes, benchmarks, Entries, responses, Tendencies, special, statistics, Operators, Languages, procedures, values, topics, lessons, Continuities, Tremors, struggles, Adversities, items, nights, failures, sittings, influences, submissions, returns, Atrocities, allusions, drivers, Records, concerns, IMPACTS, Missions, Duties, mechanisms, extremes, maintenance, surprises, threats, customs, errands, goings-on, delusions, examples, receipts, Communities, texts, visits, updates, ordeals, headlines, audiences, results, workings, change, changes, Strains, proceeds, panels, attempts, Exercises, broadcasts, arts, Germans, stocks, Foundations, targets, sectors, pieces, cycles, victims, journalists, dealings, activists, passages, Canadians, symptoms, Strikes, ways, holding, fields, actes, materials, Holidays, theatres, animations, practices, FAITS, modules, remains, mishaps, parts, counts, papers, deadlines, crossings, assaults, others, VOTES, PAGES, presence, PATHWAYS, approvals, Keys, Vagaries, Difficulties, Schedules, Prayers, Facilities, Ones, contacts, subjects, bombers, merits, mode, modes, files, Securities, Realities, people, sources, Phases, rings, linkages, Risks, Studies, data, held, players, Casualties, errors, Sports, hits, hazards, secondary, offers, forces, plans, hechos, derbies, exchanges, reasons, exposures, who, demands, talks, Postures, sets, scourges, groups, streams, days, laws, Charges, police, leadership, Memories, signs, weapons, hardships, maturities, Frequencies, grounds, links, uses, dialogues, falls, framework, products, causes, Classes, Rights, Groceries, kinds, words, twitches, passwords, spills, proofs, fewer, clashes, hours, BOMBS, schemes, Galleys, lounges, remarks, polls, how, Roles, members, periods, shapes, ec, messes, EXAMS, trails, hands, fires, problems, 2004, Parties, Lives, ADS, matters, shocks, arms, images, wing, 2005, dates, odds, chaos, powers, Having, Truths, -rrb-, passes, abuses, Your, Plays, men, 2003, skills, claims, spells, actors, Frauds, runs, place, places, figures, approaches, Bodies, shops, calls, drops, D, instruments, shares, Bases, Was, Which, actividades, 2001, choices, LINEs, organization, endeavours, services, interests, highlights, prints, findings, experiences, Efforts, objectives, Cas, affairs, personnel, Injuries, actos, Crimes, works, assays, Children, Forms. Happened, Occurred, Operated, Were, engaged, Went, Carried, conducted. operates, happens, steps, Measures, goes, Exercises, outputs, uses, services, protests, works. championships, venues, Earthquakes, stages, forum, Forums. You, at all events, Amabel, may be glad that you haven't missed it. The turn events had taken within the clearing had hurt Tharn, too. effeminate, effendi, even out, Ebionite, eventide, eventuate, evenhanded, ebonite, even-toed.